Colorado’s got the goods when it comes to succulent fruits, fresh produce and hearty local game, not to mention the creative masterminds behind exquisitely crafted bites that travelers and locals can’t get enough of. Check out these 10 Colorado must-eats and let us know if you uncover other super-local bites that you think we’ve left off the list at [email protected]. Anytime you eat in Pueblo, you’re likely to detect the famous Pueblo chile in your dish, and the Bingo Burger is no exception with flavorful chiles blended right in with the beef. But it’s got tough competition with the Goat Hill burger, which is made with juicy Colorado lamb, goat cheese, mushrooms and, for an extra kick, some lemon-rosemary aioli. Palisade is peach country, and you’ll find fare all over the region utilizing this tender fruit. For a truly explosive dish, try the peach Caprese salad at 626 on Rood. The peaches are decorated with a (get ready for this) mint-basil and smoked-paprika-reposado tequila (aged in a wooden barrel) sauce and fresh basil. It’s a must-taste twist on the typical Caprese salad for sure! A multi-time semi-finalist for the James Beard Foundation’s “Best Chef Southwest” award, celebrated chef Alex Seidel’s restaurants are crown jewels in Colorado’s farm-to-table movement. Mercantile dining & Provision in Union Station is Seidel’s latest addition to the Denver dining scene (the award-winning Fruition is the first), and he showcases a bounty of ingredients from his own Larkspur farm — Fruition Farm — in his dishes. While the eatery's offerings change regularly, the Fruition Farms SheepSkyr Cheesecake made with their Icelandic-style yogurt inspired cheese is a mouthwatering must if it's on the menu. Some of the best memories from family road trips include impromptu pit stops at small fruit stands. While traversing Colorado’s eastern plains near Rocky Ford, keep your eye out for melon stands along Hwy. 50, which pepper the highway starting in La Junta and heading west to Pueblo. The juicy sweetness from the cantaloupe and honeydews along this swath of countryside provides a refreshing respite indicative of the area’s agriculture. Traditional osso buco is an Italian dish of veal steeped in vegetables, white wine and broth. But to taste osso buco with elk at a farm-to-table cafe is a delicious mouthful. 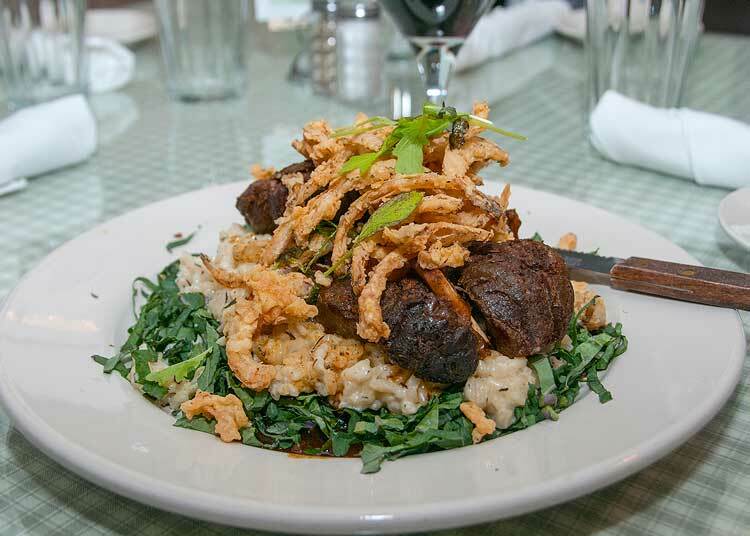 The tenderness of the elk provides sensory overload and the complementing textures of the risotto, kale and onion straws will certainly satisfy your appetite. We won’t tell if you eat more than one of these toothsome delights. The blackberry truffle, high in antioxidants, is encrusted with white, milk or dark Callebaut Belgian chocolate, famous for its premium cocoa beans, hint of vanilla and smooth texture. Charcuterie boards have become commonplace on many restaurant menus, but The Dining Room’s version puts a distinctly local focus on its offering. This historic hotel’s fine-dining outlet showcases a selection of meats and cheeses predominantly sourced from purveyors in the area, including Gosar Sausage in Monte Vista. Among the plate’s accompaniments are whole-grain mustard, cornichons and honeycomb made by Haefeli’s Honey Farms, located in Monte Vista and with a retail shop down the street from the Windsor.